This past month's weather disruption in the US and China have affected prices of commodities as production was temporarily disrupted in sectors such as oil and gas, mining as well as manufacturing. China's August industrial production and fixed-asset investments (FAI) data came in below expectations at 6% year-over-year and 7.8% year-over-year, respectively. 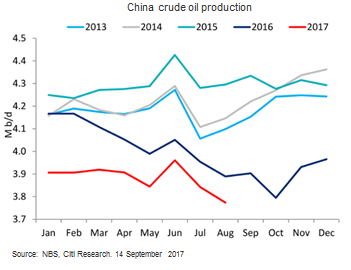 Citi analysts say that weak industrial activities were likely due to weather disruptions in southern China, compounded by intensive environmental and safety checks – which affected mining and manufacturing activities. China's slowdown in FAI growth was primarily due to weaker construction activities, while manufacturing FAI decelerated from 4.8% in July to 4.5% in August. Citi analysts anticipate sequential improvement of September macro data as weather conditions moderated and peak construction season started recently – although the environmental inspections should persist. The impact of Hurricane Harvey and measures taken ahead of Hurricane Irma's arrival in Florida earlier this month have dented US gasoline inventories, which saw the largest weekly drop since the 1990s. The US Energy Information Administration's (EIA) data for the week ending 8 September saw crude inventories increase further and refined product stocks plummet. Apparent demand for gasoline was also estimated to have jumped as demand in Texas resumed – perhaps for stocking in Florida ahead of Irma. Nationwide commercial crude oil inventories rose 5.9 million barrels to 468 million barrels though the Strategic Petroleum Reserve (SPR) saw sales of 1.6 million barrels on the Gulf Coast, making the total US crude 'oversupply' a smaller +4.3 million barrels. (A total of 5.3 million barrels from the SPR has been offered for sale to help ease hurricane impacts, with about 1.9 million barrels already released in the past two weeks). Citi analysts are positive on oil prices and base metals going into 2018.